Yatton Keynell is a village in Wiltshire, England, located about five miles west of Chippenham, and about five miles to the east of the border with South Gloucestershire. Its economy is historically agricultural although it is now more of a residential area for surrounding towns; its population in the first census of 1801 was 353 and by the most recent of 2001, this had risen to 745. The village is surrounded by a green belt and is largely a conservation area which explains why unlike other settlements it has not expanded very much over its history. The village was mentioned in the Domesday Book as “Getone”. Its name moved through several variations of this and the “Keynell” appears to have been added some time in the thirteenth century after Henry Caynell, who had a holding in 1242. At about this time, the family gave a tract of land to Stanley Abbey, and the village itself became a grange of the abbey. John Aubrey, antiquary and writer, known for his descriptions of Avebury and Stonehenge, attended the church school. 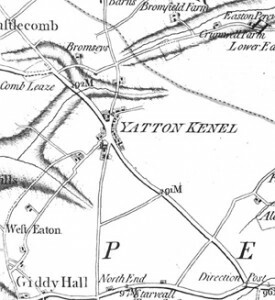 Sir Charles Snell owned land in Yatton Keynell and sold it to invest in the ship ‘Angel Gabriel’ for the expedition by Raleigh to Guiana in 1595. The family owned ‘The Manor House’ in West Yatton Lane from the late 17th century. 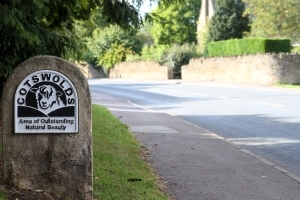 The village contains an unusual milestone showing its distance from Hyde Park Corner, London, as 97 miles, and Sodbury as 11 miles. 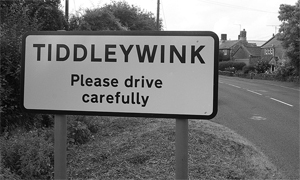 The nearby hamlet Tiddleywink made national news in 2003 following a campaign by the locals to get it officially recognised on maps.